There is just something about pulling your clothes out of the washer and dryer and inhaling that fresh clean scent. That is what happens when you use the Purex Crystals Fresh Mountain Breeze. During these freezing cold days right now, I can at least dream about spring while doing laundry! The Purex Crystals are to be added at the start of your wash. Add a little extra if you like for even longer lasting fresh fragrance. This product does not reduce the absorbency of towels and the natural formula is safe for your family and the environment. Purex Crystals are a laundry enhancer. You will find Purex Crystals in the fabric softener aisle. With 8 people in my family I am always looking for an inexpensive way to help with laundry odors and to increase the fresh, just washed scent of our clothing. There is nothing like pulling your clothing out of your dresser drawer or closet and have a fresh scent greet you. Love it! To celebrate the release of the NEW Purex Crystals Fresh Mountain Breeze the Purex brand will be hosting a sweepstakes. One grand prize winner will receive $500, while 100 second place winners will receive a coupon for free Purex Crystals Mountain Breeze. Be sure to use my unique URL to enter: HERE. The good news is, 2 of my neighbors will also each receive a coupon for a free Purex Crystals Fresh Mountain Breeze. Be sure to enter today! This would be great for when I have some really stinky clothing, sometimes they need a extra boost of fragrance! I'd like to try this new scent because I'm a huge fan of Purex Crystals and I use it with every load! I'd like to try this new scent because I've adored every other Purex product and scent I have tried. I am sure I'd love this one, too. 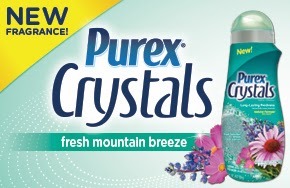 I would like to try the Purex Fresh Mountain Breeze Crystals because it sounds like a nice scent. I've tried and love the Fresh Spring Waters scent. I'd like to try it because the scent sounds so good. Plus I love Purex and it's a new product to try. I would like to try this since I enjoy my clothes smelling fresh after they are washed. I bet this would make my towels fluffy and smelling wonderful. I'd like this because Purex crystals have scent that seems to last longer than any other product I've tried! We really like Purex. They have a great product at a reasonable price. I haven't tried the mountain fresh scent yet and I would like to. I'd like to try Purex Crystals Fresh Mountain Breeze because I love Purex Crystals, and Purex in general.